The players have spoken! Interesting to get a little inside insight from the players themselves but… seriously!? During the NHL’s Player Media Tour in Chicago earlier this month, TSN reporter Frank Seravalli interviewed 33 players to get their thoughts on the upcoming season. In particular, Seravalli was interested in finding out from the players which team they think can make the biggest jump in 2018-19. In other words, who will be this year’s Vegas Golden Knights, New Jersey Devils or Colorado Avalanche? Who will come out of nowhere to make the playoffs in 2018-19? But, here’s the interesting part… Seravalli’s interviews were all conducted under the cloak of anonymity. The answers provided are not in any way tainted by how the players think they’ll be received… these are raw, unedited, from the gut responses from REAL NHLer. Some chose the Florida Panthers as a surprise team, just as *Aleksander Barkov* was a popular pick for most underrated player. It’s hard to call a 96-point team – and their newly minted captain, one of the best all-around players for a while now – a surprise, though. The Cats won’t be sneaking up on anyone. Nonetheless, it’s hard to ignore the youth movement underway in Western New York. The Sabres, who haven’t made the playoffs since 2011, were the pick of nearly half the 33 players. Their pain turned into good fortune by drafting smooth-skating *Rasmus Dahlin* at No. 1 overall. 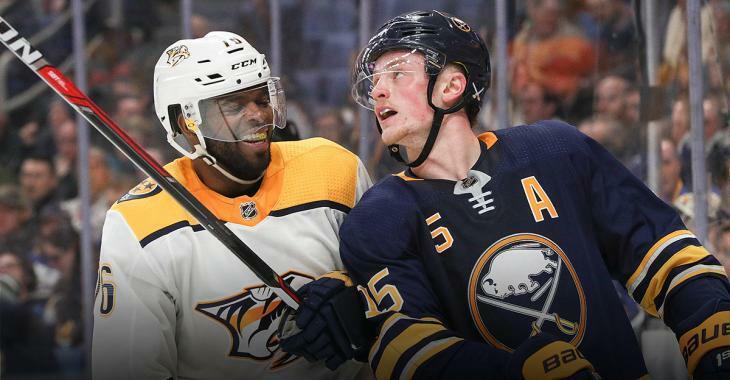 Rising star *Casey Mittelstadt* is expected to step into a big role while Alex Nylander also hopes to make the leap to the league. Many are wondering how the Sabres will cope after moving Ryan O’Reilly to St. Louis, but some believe that the return, including *Patrik Berglund* and *Vladimir Sobotka* went, unnoticed. “I know *Patrik Berglund* really well, he will be a sneaky good player,” another player said. “So I think he’ll help them more than people think.”The Coyotes didn’t make nearly as many moves. The big one was swapping *Max Domi* for *Alex Galchenyuk*, who is expected to slot in at centre, and signing speedy winger *Michael Grabner*. The bet is that their seven players on entry-level contracts this season, including *Clayton Keller*, *Dylan Strome*, *Christian Dvorak* and *Christian Fischer*, will take the next step while *Antti Raanta* remains healthy in net. So there you have it, hockey fans. Punch your playoff tickets for the Buffalo Sabres, Arizona Coyotes and Florida Panthers.